US, Australian, and French naval forces operating in the northern Indian Ocean have seized thousands of small arms and light weapons in 2016, likely bound for Yemen. Whilst initial reports indicated the first two seizures were believed to be headed for Somalia, the types of weapons seized indicate that the vessels almost certainly originated from Iran, and likely indicate they were headed for Yemen. Later US Navy statements support this analysis. On 27 February 2016, sailors from the Royal Australian Navy ship HMAS Darwin (FFG 04) boarded a fishing vessel in order to conduct a flag verification visit. 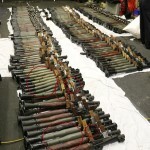 They proceeded to uncover an arsenal which included nearly 2,000 AK type self-loading rifles, 100 RPG-7 type shoulder-fired recoilless weapons, 49 PKM type general-purpose machine guns, and 20 60 mm mortar tubes. On 20 March 2016, sailors from the French Navy ship FS Provence (D652) boarded another unflagged fishing vessel, and seized several hundred AK type self-loading rifles, as well as general-purpose machine guns, 64 SVD type designated marksman rifles, and nine unspecified anti-tank guided weapons. In both cases, initial reports from CMF indicated that the vessels in question were deemed to be destined for Somalia, and the weapons were seized under UN sanctions authorising the interdiction on the high seas of illicit arms and munitions destined for Somalia. In both cases, the vessels were determined to be stateless. The crew were of “various nationalities”. Both of the seizures consist of weapons which indicate that the vessels are very likely to have originated in Iran. In particular, both ships were transporting North Korean-made Type 73 general-purpose machine guns (GPMG), an uncommon weapon which was only produced by the DPRK. The only known export customer for the Type 73 was Iran. Armament Research Services (ARES) has been tracking the proliferation of the Type 73, and has documented these GPMG in Syria, Iraq, and Yemen. In Syria, the weapon has been seen in the hands of the Syrian Arab Army and pro-Assad Shi’a militias, whilst in Iraq it has been observed in service with various Iraqi Shi’a militias, especially those associated with the Badr Brigade, a group which receives substantial Iranian support, both financial and materiel in nature, and has operated under the direct command of Iranian forces in Iraq. Other Iraqi groups have also acquired limited numbers of the Type 73, including the al-Imam Ali Brigade and the Christian Babylon Brigades. The Type 73 GPMG has also made its way to Iranian-supported Houthi forces in Yemen. Recent videos from 14 and 27 March aired by the Houthi-operated Al-Masirah channel show the Type 73 in the hands of Houthi fighters in the Taiz and Al Jawf governorates. The common denominator linking the presence of these weapons in Syria, Iraq, and Yemen is likely to be Iran. Sometime in the late 1970s or early 1980s, Iran received the only known exports of the Type 73 GPMG from North Korea. Iran made use of these weapons during the 1980-88 Iran-Iraq War and has continued to employ the Type 73 in a reserve role with the paramilitary Basij forces, with examples observed during exercises in the past decade. On 28 March 2016, sailors from the Cyclone-class patrol craft USS Sirocco (PC-6) boarded a third stateless dhow, this time seizing some 1,500 AK type self-loading rifles, 200 RPG-7 type shoulder-fired recoilless weapons, and 21 DShKM type heavy machine guns. As with the earlier seizures, this shipment of weapons contained visually distinctive items which point towards its Iranian origins. In common with the earlier Australian seizure, the presence of Iranian-style RPG-7 type shoulder-fired recoilless weapons is noteworthy. These weapons feature a distinctive olive green heat shield and pistol grip, and often incorporate yellow factory markings and a round supporting grip which is unique to Iranian and Sudanese production. Other seizures of Iranian-made weapons aboard fishing vessels off the coast of Oman have also been reported. In September last year, CMF forces from an unspecified Gulf nation seized a number of Iranian-made anti-tank guided weapons and other materiel aboard an unflagged vessel. Later statements from the US Navy indicated that the dhow may have been bound for Somalia. The lack of registry and modern navigation aids is commonplace amongst small fishing vessels in the Indian Ocean, and the swarms of similar craft give cover to pirates and drug smugglers, as well as the illicit transfer of arms and munitions. The inconspicuous fishing dhow has long been considered a key tool in smuggling operations operated by Iran’s Revolutionary Guards in the Persian Gulf. It is possible that the weapons in question may have been headed to Somalia for local or secondary sale, but it’s more likely that they were destined for Yemen, either directly or via Somalia as an intermediate port. In previous cases, illicit Iranian cargoes have made their way through neutral ports to help disguise smuggling attempts amongst the clutter of maritime traffic. Regardless of their destination, it is a near-certainty that these illicit shipments originated in Iran. 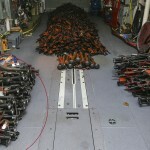 Weapons seized by HMAS Darwin. Note RPG-7 type recoilless weapons at left, and Type 73 GPMGs at right. 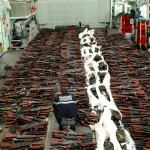 Weapons seized by USS Sirocco. Note RPG-7 type recoilless weapons with physical features consistent with Iranian manufacture. Weapons seized by FS Provence. Note Type 73 GPMGs at left.